For the last 18 years, backpacking has become a passion. I am a four-season backpacker and an off-trail navigator. Although I do take yearly trips to the American West or Southwest, the majority of my trips are in Michigan and Canada. 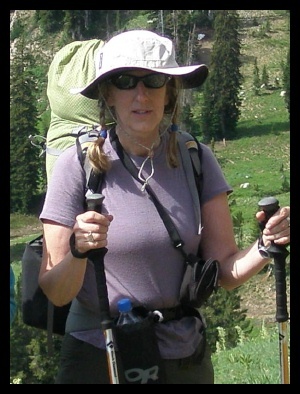 My pack weight varies considerably, but my base weight is under 18 lb (8 kg). I am primarily a tarp camper who averages over 50 nights a year backpacking in a huge variety of weather conditions including relentless rain, wet snow and sub-zero (0 F/-18 C) temps. The Patagonia Wool 2 T-Shirt is a "performance" baselayer garment that is fabricated with chlorine-free merino wool. The wool is of an extra-fine gauge and is made with a pointelle pattern. The women's version of the shirt has a contoured or feminine fit. This attractively styled shirt can be worn solo or layered with other clothing. Other features include flatlock seams, raglan sleeves, a crossover-style collar and a slight droptail hem on the back of the garment. I purchased the Patagonia Wool 2 T-Shirt about 7 to 8 months ago. Although I regularly wear several other types of wool upper layer garments, none of them have short sleeves or were in a light color. The latter two qualities are what possessed me to buy the Wool 2 T-Shirt when I saw it on sale. Since its purchase, I have not only worn it for many backpacking trips but I have also worn it for trail running and mountain biking. 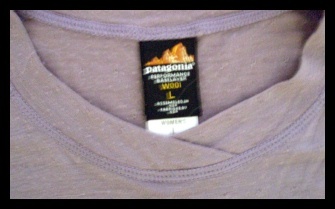 The Patagonia Wool 2 T-Shirt was worn on many of my backpacking trips in the states of Michigan and Wyoming, USA. Most of my area of travel covered hilly boreal and deciduous forests in the Midwest and mountainous travel in Wyoming. Elevations ranged from 600 ft (183 m) to over 10,000 ft (3048 m) and temperatures ranged from a low of 34 F(1 C) to nearly 90 F (32 F). Because the shirt features a contour fit, I bought it in a size Large. It fits quite nicely without excess fabric bunching up underneath my backpack harness. The shirt features raglan sleeves that lie flat against my skin and are not irritating when I wear a backpack. The seams are all finished with a fine flatlock-stitch construction that is very smooth. Although the Wool 2 T-Shirt in all practicality is a basic product, it does have some extra features to give it a bit of style. Foremost is the merino wool fabric itself which is knit in a pointelle pattern. The collar also adds a bit of flair with its separated or crossover style. This feature also adds some stretch to the collar area. The back of the shirt has a slight droptail hem. When the shirt is tucked into my shorts or pants, it stays in place without leaving a gap when I bend over to pick something up. Although I have comfortably worn the Wool 2 T-Shirt in temps up to nearly 90 F (32 F), most of the time the temps were mid 60 F to mid 70 F (16 C to 21 C) range. I often layered the shirt with a long sleeve hooded Capilene shirt, then when it got warmer I would remove the outer layer. The pointelle-pattern knit with its tiny holes no doubt helps with the ventilation of the light fabric. While wearing the shirt, I have never been uncomfortably hot nor has the shirt felt clammy against my skin. I have found the shirt to be very comfortable to wear during all of my activities. Although most of the shirt stays visibly dry during exertion in most areas, I have noticed that it gets quite wet from the direct contact with the back of my backpack. The latter does not feature a breathable mesh backpanel so my back has direct contact with the nylon material itself. This is an issue with any shirt I wear so it has nothing to do with the Patagonia Wool 2 T-Shirt itself. Although the t-shirt would get wet, it was never uncomfortable while I was wearing it. After I take the backpack off, it normally dries quick enough even in somewhat humid weather. I have also worn the shirt for many trail runs and mountain biking. The droptail hem has worked great for the latter and I have favored it over my other synthetic jersey tops that I previously wore. Being that the Patagonia Wool 2 T-Shirt has a great appearance to it, it can also be worn for comfortable casual wear. I have packed it for trips that were a blend of hiking and sightseeing and it has functioned well for both. Although it has been my primary upper body garment on trips during the last several months, it does also pack well when I am not wearing it. I simply fold it into a small square or roll it into a small bundle and store it in a stuff sack with other clothing items. It does appear wrinkled when it first is straightened out but the wrinkles disappear after a short time of wearing it. So far, the t-shirt has held up well. I have checked it carefully and I don't see any real issues with the fabric or seams. There is piling on the fabric but it really isn't that noticeable due to the pointelle design that already gives the t-shirt texture. In addition, the fabric has not seemed to hold any odors even though I often wear it multiple days in the field without washing it (during my last trip, I never took it off for the entire four days). I haven't done anything special to care for the shirt other than to machine wash it often at home. It's probably been washed at least 20 times with my regular laundry and then I normally hang it on a drying rack. Patagonia uses FTC symbols (Federal Trade Commission) on their care tags and the instructions for the shirt indicate to machine wash on gentle, no bleach, dry flat and iron on low if needed. The color of the merino wool fabric hasn't noticeably changed or faded. The Patagonia Wool 2 T-Shirt will certainly remain a staple in my wardrobe until it wears out or I find something that I like even more.